Born in 1999, Samuel Hirsch entered the Lausanne Conservatory in 2003. After following musical initiation lessons, he began studying violin at the age of seven under Tina Strinning. In 2012, he joined classes led by François Sochard, concertmaster at the Lausanne Chamber Orchestra. 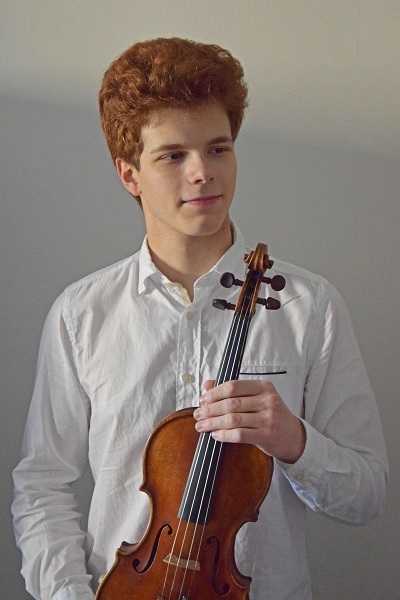 At the age of fourteen, he’s accepted to study the Bachelor violin programme under Renaud Capuçon, and simultaneously continues his studies in secondary school. He obtained the Swiss Maturité and a Bachelor from the Lausanne University of Music in June 2017, and is now continuing his studies under Renaud Capuçon to obtain a Master. Since 2009, he followed or has been following chamber music lessons given by Hans Egidi, violist of Sine Nomine Quartet, Dagoberto Linhares and Vincent Coq, pianist of the Wanderer Trio. He has played in several orchestras (the Lausanne Conservatory, HEMU, Quipasseparlà, Des Jeunes de la Suisse Romande, etc.) and frequently gives concerts in Switzerland and abroad. He has notably won two First Prizes with Distinction and several Special Prizes, solo and with his quartet, at the SJMW CLASSICA 2016, and was nominated for the Youth Prize Lausanne, in December 2015. He often follows masterclasses with teachers such as Shmuel Ashkenasi, Ingolf Turban, Helge Slaato, Gilles Apap, and in chamber music with the Sine Nomine quartet, Markus Fleck of the Casal Quartett, as well as Gábor Takás-Nagy. If you are interested in working with Samuel, please get in touch with the EMCY Office.